This plug-in is a DHCP server which provides IPv4 addresses and settings to local computers and devices. The DHCP data is also used to serve DNS requests (forward and reverse) making it very simple to locate any local DHCP client by name on a local network. Select which local IP address you want to serve DHCP on. 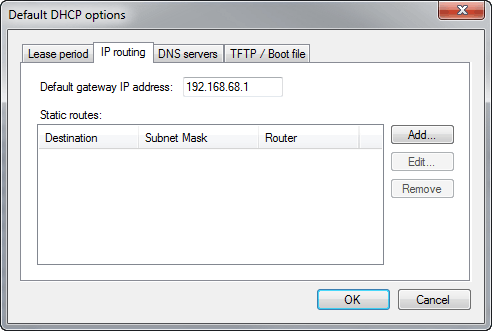 Shows the IP subnet mask for the selected server IP address. This subnet mask will automatically be provided to DHCP clients. The DNS suffix domain name assigned the DHCP clients. Specify the range of IP addresses (a.k.a. "DHCP scope") to dynamically assign IP addresses to DHCP clients from. Click this button to configure default DHCP options (see below). 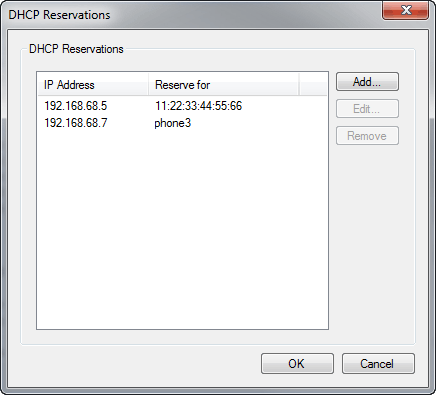 Click this button to configure DHCP reservations (see below). When checked, Simple DNS Plus will create/update an A-record for each new/updated DHCP lease. Requires a local forward primary zone for the DNS suffix or a parent name. This is only needed if you have multiple DNS servers hosting the DNS suffix and you want A-records for the DHCP leases automatically transferred to secondary DNS servers. 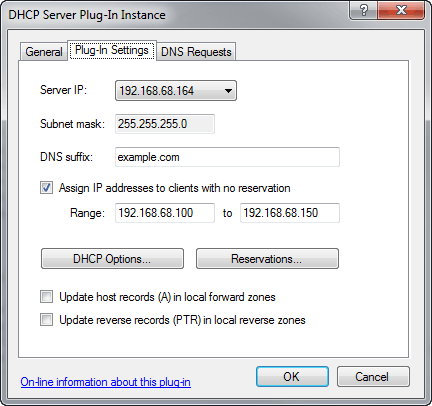 When checked, Simple DNS Plus will create/update a PTR-record for each new/updated DHCP lease. Requires a local reverse primary zone for the IP addresses assigned by the DHCP service. This is only needed if you have multiple DNS servers hosting reverse DNS for the IP address range and you want PTR-records for the DHCP leases automatically transferred to secondary DNS servers. The DHCP Options dialog can be accessed in 3 ways - from the main DHCP Plug-in dialog (see above) for setting the default options or from the DHCP Lease dialog (see) - either as options for a single lease or as options for a group of leases. Specify how long DHCP clients are allowed to use their assigned IP address. This is the maximum time the client computer may use the IP address without getting the lease renewed. Typically after half the lease period has elapsed, the client computer will attempt to renew the lease. These options are typically used in combination with a TFTP server to enable PXE / disk less booting of PCs, provisioning IP phones, etc. Reserve IP addresses for specific clients based on computer/device name or hardware address (network card MAC address). To determine a computers hardware address on Windows NT4/2000 and later, run "IPCONFIG /ALL" from a command prompt, and see "Physical Address". For each reservation, you can specify an alternate set of options - either for the individual reservation or for a group of reservations. For MAC based reservations, you can optionally specify a host name that will be assigned to the client (through the DHCP response and in local DNS data). The list can be sorted by clicking the column headers. To manually delete a DHCP lease, right click on the lease and select "Delete" from the pop-up menu. In order to prevent IP-address conflicts (two or more computers having the same address), it is important that the computer for the deleted lease is also rebooted or removed from the network. Generally, it is not necessary to delete leases manually, as computers automatically release their leases when shut down properly. Older Apple/Mac clients and some devices which do not supply a computer name in the DHCP request will show with their hardware address as the name. To rename these, right click on the lease and select "Rename". The new name will be associated with the client's hardware address (MAC), and remembered as long as you run Simple DNS Plus even if the IP address changes. 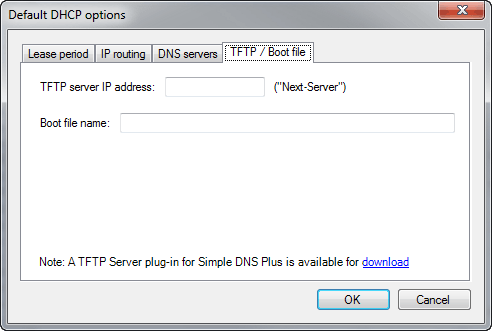 To configure a Windows computer to get its IP address from a DHCP server, configure it to "Obtain an IP address automatically" in TCP/IP protocol settings (under network properties). If your server computer is connected to multiple local networks, you can use multiple DHCP server plug-in instances. NOTE: When multiple DHCP leases are active for the same client name, DNS will resolve to the IP address of the DHCP lease that expires last (newest). This ensures that DNS resolves correctly for laptops and other devices moving between wired and wireless connections. 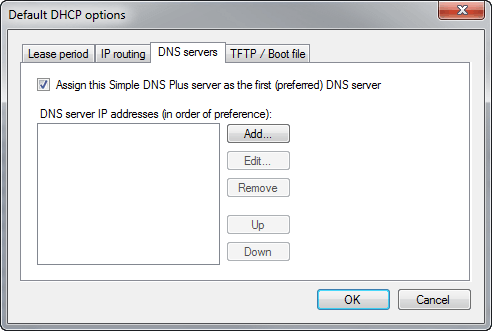 Note: This update is included with Simple DNS Plus v. 7.0 build 102 and later.